Vivi, Honora, and Clover are the Mayhem sisters, and thanks to an old family curse, trouble is never far away. In the witching world of Everland, magic is everywhere. Growing up all young witches are taught the arts of spellcasting, potions, charms, earth magic, and wandwork, but what really makes a witch special is her persuasion, the magical power she is born with. Potion master Vivi Mayhem spends her days brewing up magical elixirs for her successful shop, The Potion Garden, in the quiet town of Willow Realm. But the middle Mayhem sister is hiding a dangerous secret. Her troubles begin when her true magical persuasion of prophecy forces her to see a terrible crime—a young witch kidnapped and tortured by an evil practitioner of black magic. In her desperate quest to save the witch, Vivi must learn to master her burgeoning magical abilities in the face of skepticism from Willow Realm's handsome sheriff and strong resistance from the Witch Council's top security force. Hex Division doesn't want Vivi anywhere near the investigation, especially after her increasingly disturbing visions implicate the most powerful healers in Everland, the mysterious Mender twins. Events take a turn for the worse when Vivi discovers the involvement of the Darklander, a ruthless fringe wizard who is involved in mysterious dealings in the Dire Woods that surround his mansion. Vivi's going to need all the help she can get from her sisters to rescue the missing witch and prove she isn't just seeing things. 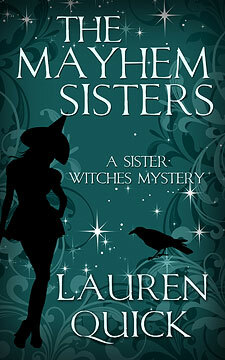 Brimming with magic, mayhem, and a trio of cunning sister witches, The Mayhem Sisters is a paranormal mystery that will keep you guessing until the very end.